Ask anyone their definition of being “fit,” and you’ll probably get a variety of answers: running a 5k in under 30 minutes, bench-pressing 250 pounds, or finishing an entire P90x workout without puking. However, one of the most common answers that you’ll hear is whether or not the person has a six-pack – the name for abdominal muscles that are stacked in a semi-symmetrical pattern on your midsection and look like they were cut out of a slab of solid granite. But how realistic is that promise? Can a person really go from squishy to steel in less than two months? What Exactly Is A Six Pack And How Do You Get One? The technical term for the abdominal muscles that most people think of is the rectus abdominus, which makes up the “six-pack” on the front of the torso. The muscle groups that have to be worked to create the full look are the obliques and transverse abdominal or TVA. Working all these different sets is the difference between having an ab set that looks defined and filled out, or abs that are just kind of floating in the midsection. Although there are thousands of fitness programs that make the “six-pack in six weeks” promise, the principles of attaining one are quite simple: proper diet and exercise. The difference between having a well-defined midsection lies in the attention to detail; you’ll have to make a more focused effort on building up your core as well as becoming even more strict about what goes into your mouth. Indeed, unless you’re some kind of super freak, you’ll most likely need to get your body fat percentage below 10% to have even a prayer of those treasured abs peeking through. Two common misconceptions when it comes to core development are that it just takes a lot of exercises, or you have to be lean to make those muscles show through. Both of those assumptions are incomplete: you can have the biggest ab muscles in the world, but if there’s a layer of fat hiding them, no one will see them. Likewise, if you’re at 4% body fat but have no muscles to speak of, a “lean” look will get you nowhere. The key is to have both: low body fat percentage and a well-developed core. For guys, you’re looking for a body-fat percentage of at least 10%, but ideally, 8%, as the core muscles are harder to define than the six-pack in front is. Unless your body fat percentages are this low, your abs probably won’t show well. At the end of this article is a list of ab exercises you can do to work the It is also essential to focus on increasing resistance of your exercises by adding a little bit of weight to every workout. Focus on all three parts of your core – rectus abdominis,, your serratus, and your obliques. Working on these three groups, along with reducing your body fat percentage, is the simple (but hard) secret to a killer set of abs. If you take one look around at most of the people walking this earth, you’ll find more people that have slightly pudgy midsections than those that have a flat stomach with good posture. While a this may be considered “normal” for the average person, it’s a far cry from the bodies that fitness bloggers and gurus promise can be attained in a short time period. This mainly a result of our sedentary lifestyles in the modern age. A recent study of 13,000 Americans showed that there is a gross imbalance between the BMI (Body-Mass Index) and the actual body-fat percentage, especially when compared to people from Europeans of similar size and build. For those who have a BMI below 25, for instance, American males have a body fat percentage of 23 percent, while women were closer to 34 percent. By comparison, European men and women of a similar BMI had body fat percentages of 18 and 25 percent, respectively. What this means for the average American male, concerning getting that ever-so-desired six-pack, is that most of us have a long way to go before we even get to the point where our abs are remotely visible. While we may be destroying ourselves in the gym day after day, unless we can reduce our body fat percentage, a thick layer of flab will simply rest on top of your muscles and hide that Adonis body from all of your potential admirers. Six Pack in Six Weeks…or Six Months? Any fitness program, regardless of what it targets and what the overall goals are, require a firm commitment by the individual to push yourself and monitor food intake for months, not days or weeks. Unfortunately, these programs that make claims of “fast fitness” prey on consumer’s desires for instant gratification and muddy the waters of what it will actually take to gain your desired physique. On average, you should shoot for about a pound of weight loss per week. This not only provides a realistic goal for nearly everyone to focus on but also allows you to focus on your overall fitness rather than just blasting away at your abs. No matter your starting point, nearly everyone can achieve a cut and well-defined six-pack within a year’s time, given the proper diet and exercise. Taking our average American male’s body-fat percentage of 23 percent, and calculating about one pound of weight-loss per week, it will take about 27 weeks total to reach your goal. 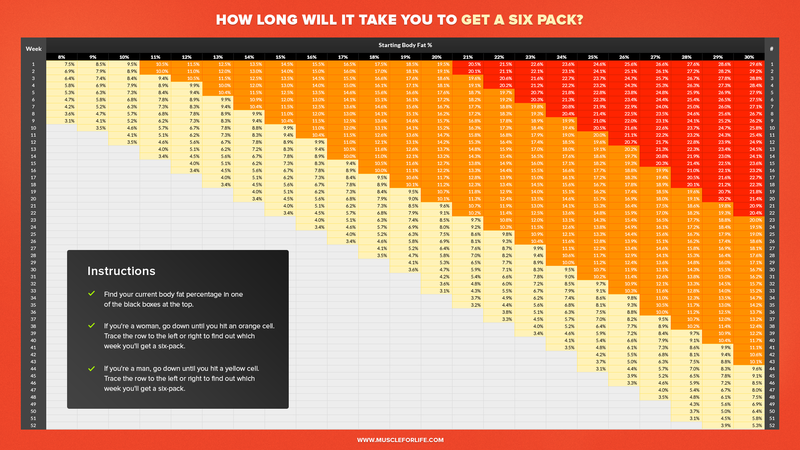 The higher the fat percentage, the longer it will take (here’s a chart that will help you estimate how long), but it’s important to set realistic expectations and pace yourself. Rome wasn’t built in a day, and neither will your body. In a word: dedication. Not only will you have to maintain a consistent base of solid strength training, but you’ll also need to focus on the types of foods you eat and how much of it you’re putting into your mouth. Remember, the average timeline for an American male is six months, so if it’s July 4 and you’re hoping to have rock hard abs by Labor Day, you may want to dial back the expectations a bit, lest you be disappointed and give up altogether. The two parts of any complete workout routine are diet and exercise. Cleaning up your diet will do wonders for your overall health, but if you want to get that six-pack, you’ll have to be a bit more discerning when it comes to food choices, not only in eating the right foods making sure they’re in the right quantity. At its most basic, losing weight is all about your energy balance, which is regulating the calories that you bring in with the calories that you burn off; burn more calories than you take in, and you lose weight – it’s that simple. Instead of being day-to-day, these calories can accumulate over a week or more, so if you know that you’re going to be consuming a lot of calories on one day in particular, like Thanksgiving or dinner party, for instance, it would be wise to decrease the calorie amount in the days beforehand. Eating an extra 150 calories over your food “budget” every day can add up to an additional five pounds over a six-month period. However, attaining a lean midsection requires more than just weight loss. You specifically need to be losing fat and ideally maintaining (or even growing) muscle during the process. To do this, you’ll need to not only stay under your calories, but you’ll also need to eat a certain amount of protein, carbs, and fat. Flexible Dieting is one of the best ways to take charge of your diet. Also called “If It Fits Your Macros” (IIFYM), this method of eating is all about calculating your daily dietary needs, calculating the number of macros you need to reach your goal, and eating foods that help to hit those numbers. It’s relatively simple and enables you to keep track of your diet efficiently and effortlessly. When it comes to exercise, many people instinctively think that the key to a killer set of abs is as easy as 10,000 crunches every day, and twice-a-day if you have the time. While this sounds simple enough, it’s an incomplete view of what it’ll really take to washboard abs. A solid ab routine engages your entire core, made up of all the different muscles that help you twist, duck, and stretch. Below are some of the most effective exercises that will work every part of your midsection. 1. Cable Crunches: Get on your knees in front of a cable machine and bring the rope down to behind your neck. Pick a weight that you is challenging-yet-comfortable, and round out your back while lowering your head to the floor. Hold for a few seconds, then return to the starting position. 2. Knee Raises: Hang onto a chin-up bar and let your legs dangle below you with your feet together. Then, slowly bring your knees up to your chest and squeeze your lower abs, and return your feet back to the floor, keeping control through the entire process. 3. Roll-Up: Put your hands on the ground in a plank position and place your legs behind you on a medicine ball. While maintaining proper form, roll your legs up to your chest while still on the ball, and then roll them back out. 4. Leg Tucks: Sit on a bench with your legs outstretched and feet together, and bring your knees to your chest and out as quick as possible while still keeping good form. To work the obliques, turn your body slightly and perform a couple sets on each side. To shortcut this whole process, many people will turn to supplements or some other kind of pharmaceutical intervention to supercharge their body with the nutrients they need to take their workouts to the next level. While there’s nothing inherently wrong with using supplements, and there are several benefits to using the right ones (check out our “Best Fat Burners” article), they also don’t work for everyone and aren’t necessary to attain a very respectable set of abs. It’s much more straightforward than that, and books like “Bigger, Leaner, Stronger” by Mike Matthews break down the process into a simplified and understandable path. If getting a six-pack were easy, then every person you saw would have one, and the average body-fat ratio would be about half of what it is currently. Since it’s not, you have to know going in that it will be a serious commitment and one in which you’ll have to navigate through some pretty tough stretches. If you can persevere and follow a consistent plan of action, you’ll end up with those washboard abs that people drool over. Just remember to put on a shirt every once in a while, so you don’t make the rest of us feel bad.